Unosh - a visitor to the town of Hommlet - was often seen at the of the Inn of the Welcome Wench during his stay. When he overheard the party talking about the search for Spugnoir, Unosh claimed that he had been to the Moathouse very recently and he did not see anyone there. However, he offered to guide the band of adventurers there… for a price. He started the negotiations high at fifty gold coins, but Tinivias haggled him down to five coins in hand and five after they returned to Hommlet. Unosh gladly accepted. He intended to lead the party into an ambush, so all their coinage would be his regardless. He had difficulty concealing his glee, so Alazen called on the power of Al'Akbar to read Unosh's mind. A brief, whispered team discussion ensued and the plan was set. Once Hommlet was far behind them, Tinivias immobilized the traitor with his mental might. Valmiki sat on Unosh's back, given his propensity for wriggling loose of Julie's square knots. Tinivias asked several questions and though Unosh refused to speak aloud (save for profanities), he could not completely suppress his thoughts, allowing Alazen to relay his answers. The group of adventurers soon devolved into petty squabbles over the assassin's ultimate fate. Tinivias advocated slitting his throat and leaving him in the woods, while Derren wanted to return him to Hommlet for trial. The argument became moot when Chatrilon abruptly stopped breathing, leaving the two healers utterly clueless as to the cause of his demise. It was generally speculated, however, that Unosh had somehow taken his own life to prevent them from learning more about his allies. Zeke, being a man of honor, refused to simply dump the body and gave Chatrilon his last rites and a quick roadside burial. 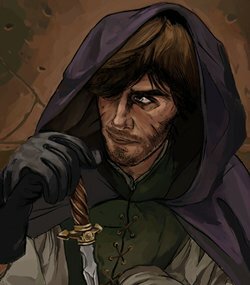 Now the party must steel themselves to stand against Unosh's dark clerics and ultimately, his dark master.